At mass flow rate of 0.5 kg/s and equivalence ratio are 0.7 to 0.8 ,the cold flow of CFD (computational fluid dynamics )analysis in swirler is done at 400, 500 and 620 are respectively of vane angle. Also find out aerodynamics flow properties in swirler at respective vane angles. At vane angle of 400, 500 and 620, the swirler numbers are 0.6, 0.9 and 1.3 respectively is calculated.So purely CFD analysis of aerodynamics properties of flow in swirler at various mentioned vane angle is investigated and to be designed improvement of swirler with high efficiency of aerodynamics mixing of air and fuel. To support experimental design with CFD analysis will be the key role to predict the improvement of performance and efficiency of swirler. Amit Kumar and Mr. Vinay Yadav. "Computational Analysis On Cold Flow in Swirler by Aerodynamics Properties." 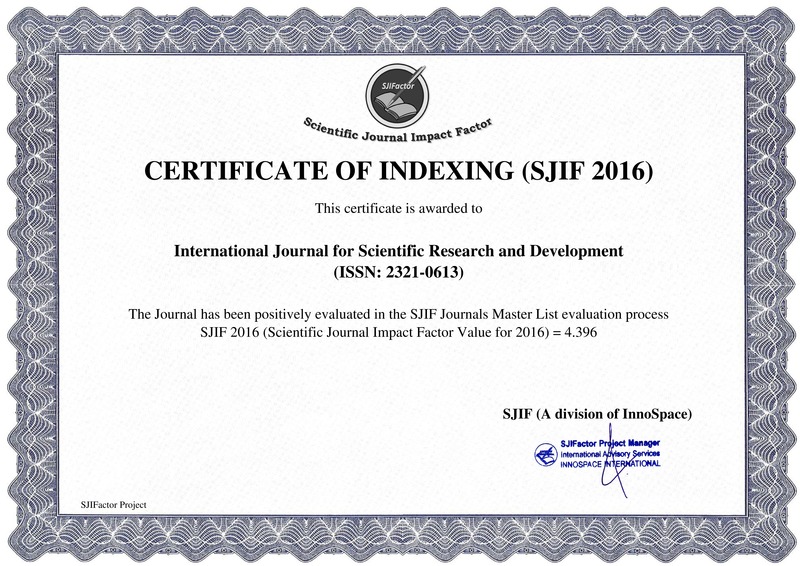 International Journal for Scientific Research and Development 4.6 (2016): 1-3. The objective of present research is to design of SCC and to investigate the effect of inclusion of chopped basalt fiber, glass fiber & carbon fiber on fresh properties and hardened properties of SCC. Fresh properties comprise flow ability, passing ability, and viscosity related segregation resistance. Hardened properties to be studied are compressive strength, splitting tensile strength, flexural strength. Fiber reinforced concrete (FRC) is widely practiced with high ductility and sufficient durability. Fiber-reinforced self-compacting concrete uses the flow ability of concrete in fresh state to improve fiber orientation and in due course enhancing toughness and energy absorption capacity. In the past few years there has been a boost in the development of concretes with different types of fibers added to it. In the present work the mechanical properties of a self-compacting concrete with chopped Basalt, glass & Carbon fiber of length 12mm, added in various proportions will be studied in fresh and hardened state. Vijay Singh Solanki and Rajiv Kumar. "A Study On Mechanical Properties of Chopped Fiber Reinforced Self-Compacting Concrete." International Journal for Scientific Research and Development 4.6 (2016): 4-6. Data Mining widely used in many fields such as medical research, financial, medication and among govt. departments. For last years, query processing on relational data has been studied very much, and many solutions to query processing have been proposed under different scenarios. Classification is one of the applied works in data mining applications. As increasing use of cloud computing, users are able to outsource their information as well as the data management tasks to the cloud. This paper focus on different k-nearest neighbor (kNN) query problem over encrypted database outsourced to a cloud: a user issues an encrypted query record to the cloud and the cloud returns the k closest records to the user. This paper is motivated by need of secure classification technique to outsourced data to the cloud. Rupali R. Gadekar and R. S. Bhosale. "K Nearest Neighbour Classification over Encrypted Relational Data." International Journal for Scientific Research and Development 4.6 (2016): 7-8. Renewable energy sources play an important part in electric power generation; solar energy is a good choice of an electric power generation. As the solar energy is directly converted by solar photovoltaic modules. In this paper we present the output variation and check compatibility with different load conditions. R, L, C type loads are used in standalone SPV system. Every system behavior and harmonics are changed according to its designing and modeling. We have designed Simulink model of SPV system. In this model we are discussing different types of factor like temperature, seasonality, soiling, system voltage and loads. This reviews the generalized mathematical modeling and simulation of Solar Photovoltaic System. a diode equivalent circuit is employed in order to investigate load characteristics of a solar module MPPT algorithm, Step up DC-DC converter and a Single phase grid tied inverter using MATLAB/Simulink. Rahul Tamrakar, Gaurav Jain and C. S. Sharma. "Performance Analysis of SPV System at Different LOAD Conditions." International Journal for Scientific Research and Development 4.6 (2016): 9-15. CuSiC composites are attractive metal composite materials due to their strength, ductility and toughness that features in thermal management and structural application for electronic component. This article focuses on techniques used to manufacture CuSiC composites, casting and powder metallurgy are extensively used to manufacture the composites. An effort has been made to highlight the material processing, properties and application of the CuSiC composite. In this review article the thermo-physical, electrical and mechanical properties have16 been reviewed. And future prospects also have been discussed. Mahesh Prasad Prajapati, Dr. P. L. Verma, Sanjay Jain and Hemant Jain. "Overview of Cusic Composite Material." International Journal for Scientific Research and Development 4.6 (2016): 16-19. Marble dust is a waste material which is obtained from the marble quarrying plants. This is generally of used in landfills, in this project a study has been carried out on concrete to check suitability of marble dust in concrete and its effects, marble dust is added in concrete from 0 to 100% at an interval of 25% as a partial and full replacement of fine aggregate and its properties like workability, compressive strength is check. For this project M 40 concrete is casted and marble particle between 90 micron to 4.75 mm is used in this study which is differentiate by IS sieve. Amit Nayak, Dr. P.H. Patil and Dr. A.C. Nayak. "Utilization of Limestone Dust and Marble Dust in Concrete." International Journal for Scientific Research and Development 4.6 (2016): 20-21. Amit Nayak, Dr. P.H. Patil and Dr. A.C. Nayak. "Effects of Limestone Dust and Marble Dust On Properties of High Strength Concrete." International Journal for Scientific Research and Development 4.6 (2016): 22-27. A pressure vessel is a closed container designed to hold gases or liquids at a pressure different from the ambient pressure. The end caps fitted to the cylindrical body are called heads. The aim of this research is to carry out detailed design & analysis of a pressure vessel for the application of air storage. It is a low pressure vessel since the internal pressure is 1.48 MPa. In this research paper geometrical and finite element model of Pressure vessel has been created using ANSYS 15.0 software. Optimization process has been also applied using ANSYS 15.0 by screening method. This optimized value reduces the stresses (13.10 % for head & 9.088 % for shell) in the pressure vessel, which will increase the life of the pressure vessel and reduce the chances of bursting the pressure vessel. The optimized value of mass reduces the weight (18.57% for shell), hence reduce the material cost of the vessel. Also using optimized values of shell and head obtained by screening method Pressure vessel has been fabricated. Bhagatsinh Verma and Ankur Malviya. "Design Optimization and Fabrication of a Low Pressure Vessel." International Journal for Scientific Research and Development 4.6 (2016): 28-32. Bio-diesel is one of the most promising alternatives for diesel needs. Use of edible oil may create shortage of oil seeds for daily food, which necessitates identification of new kinds of non-edible vegetable oil. The modernization of increase in the number of automobiles worldwide, the consumption of diesel and gasoline has enormously increased. As petroleum is nonrenewable source of energy and petroleum reserves are scarce now a day, there is a need to search for alternative fuels for automobiles. The intensive search for alternative fuels for compression ignition engines has been focused attention on fuels which can be derived from biodiesel in this regard cotton seed and castor seed oil is found to be a potential fuel for C.I. engines. The properties of Rice bran oil is determined by using standard methods. The experiment is to be conduct when the engine fueled with of 20%, 40%, and 60%, blend with diesel. The injection pressure is used 180 and 200 bar and engine speed is kept constant at 1500 rpm. Then investigate the performance, emission and combustion characteristics of single cylinder four stroke compressed ignition engine at different brake power outputs, and then compared with that of diesel. Rakesh and Harishchandra Astagi . "Effect of Injection Pressure and Compression Ratio on Engine Characteristics of CI Engine using Biodiesel (Rice Bran Oil)." International Journal for Scientific Research and Development 4.6 (2016): 33-43. A Mobile Ad-hoc networks formed by a collection of mobile nodes that are connected dynamically, in which each node act as router to all other nodes. Because of the absence of centralized administration this network is self-organising. Efficient routing protocol can make MANET more reliable. MANET is expected to be very useful for the formation of temporary networks in battlefield and disaster recovery such as fire, safety and rescue operations, meetings in which people likes to quickly share information. Mobile nodes in such network communicate with each other via wireless links because the nodes are moving, routing in such setup is always a challenge. In MANET, we are using Trust based QOS aware routing protocol i.e. TAODV for identifying the nodes in the network. Since, trust is mandatory in routing for transmission of data securely. We purpose a trust based routing protocol for mobile adhoc network known as TAODV. This paper presents a comprehensive study about the working of AODV protocol and for improvement /enhancement in AODV, a new protocol TAODV is purposed to improve the end to end delay, Packet delivery ratio, Throughput, Energy consumption, Network routing load and also discusses its comparison with AODV, MAODV, and RAODV protocol. Arushi Sharma and Sarabjeet. "A Noble Reactive Routing Protocol for Mobile Ad-Hoc Network based on AODV." International Journal for Scientific Research and Development 4.6 (2016): 44-52. In the current information technology scenario cloud storage is one of the best database platforms which provide the high security to stored data, and also decrease burden of local data storage and maintenance. Elimination process of third party auditor which is helpful for checking whether user which using cloud services is authorized or not. Main problem in cloud computing was issues of data integrity, data privacy and data access by un-authorized users. Storage and sharing of data in cloud can be easily modified by users. To overcome this data modification idea by cloud signature is provided to each individual who access data in cloud once the data modified by the user on block the user must ensure that the signature is provided on specific block when user get revoked from accessing cloud the existing user of that cloud must resign data signed by the revoked user to resigned data user must download the entire data and signed it. This difficulty is rectified with novel public auditing mechanism idea of proxy resignature .In addition to this security of the data also enhance with the help of public verifier who is always able to audit the integrity of shared data without retrieving the entire data from cloud. Swati Jagannath Avhad and Prof. Ashok V Markad. "In Public Auditing Cloud Based Group user Revocation with Data Integrity for Efficient user Revocation." International Journal for Scientific Research and Development 4.6 (2016): 53-56.
fiber reinforced concrete is the mixture of concrete with discontinuous discrete fibers. Fibers in concrete increase the tensile strength and also reduce the growth of micro cracks in the concrete. Fiber reinforced concrete is very effective and economical process to enhance the physical and mechanical properties of the concrete. Polyester fiber is a synthetic resin in which the polymer units are linked by ester groups. Use of polyester as fibers greatly effects the properties of concrete, In this paper an attempt is made to review the effects of acidic curing on treated and untreated polyester fiber reinforced concrete and its properties. R.K. Gupta and Anubhav Kumar Hindoriya. "Effects of Acidic Curing on the Properties of Treated and Untreated Polyester Fiber Reinforced Concrete." International Journal for Scientific Research and Development 4.6 (2016): 57-59. One of the electronic systems that enable to communicate by speech without an audible acoustic signal is Silent Speech Interface. The work investigates the usability of muscle contractions detected by surface electromyography (EMG) sensors as an input channel for Silent Speech Interface. Therefore, the technology enables speech recognition to be applied to silently mouthed speech. The work describes the outcomes in using artificial neural network to recognize and classify human speech based on EMG signals which are captured at the facial muscles, records the activity of the human articulatory apparatus and thus allows tracing back a speech signal even if it is spoken silently. Since speech is captured before it gets airborne, the resulting signal is not masked by ambient noise. The preliminary results demonstrate that the proposed technique yields high recognition rate for classification of unvoiced words using SEMG features. The output of Silent Speech Interface has the potential to overcome major limitations of conventional speech driven interfaces: it is not prone to any environmental noise, allows to silently transmitting the confidential information, and does not disturb bystanders. The results demonstrate that the system is easy to train for a new user. This work forms the basis for further researches to use EMG signals to improve large training dataset and uses of different languages based model. Geeta Nana Sonawane, Geeta N. Sonawane, Mrs. A. N.Shewale and Ms. Gunjan G. Gujarathi. "Electromyography based Word Recognition for Silent Speech Interface." International Journal for Scientific Research and Development 4.6 (2016): 60-65. As the data grows exponentially exploding on the 'World Wide Web', the orthodox clustering algorithms obligate various challenges to tackle, of which the most often faced challenge is the uncertainty. Web documents have become heterogeneous and very complex. There exist multiple relations between one web document and others in the form of entrenched links. This can be imagined as a one to many (1-M) relationship, for example a particular web document may fit in many cross domains viz. politics, sports, utilities, technology, music, weather forecasting, linked to e-commerce products etc. Therefore there is a necessity for efficient, effective and constructive context driven clustering methods. Orthodox or the already well-established clustering algorithms adhere to classify the given data sets as exclusive clusters. Signifies that we can clearly state whether to which cluster an object belongs to. But such a partition is not sufficient for representing in the real time. So, a fuzzy clustering method is presented to build clusters with indeterminate limits and allows that one object belongs to overlying clusters with some membership degree. In supplementary words, the crux of fuzzy clustering is to contemplate the fitting status to the clusters, as well as to cogitate to what degree the object belongs to the cluster. Aditya Deshpande and Dr. Pramod Patil. "Ascertaining Hidden Semantics in Web Documents using Fuzzy Clustering by Feature Matrix Approach." International Journal for Scientific Research and Development 4.6 (2016): 66-75. Higher production performance and larger feed efficiencies in modern day poultry have made them highly vulnerable to heat stress. Ambient conditions, especially high temperature in combination with high relative humidity in poultry shed leads to heat stress in poultry birds and in turn reduces their productivity and increases mortality significantly. India, being predominantly a tropical country, the day time temperatures during summer reaches as high as 45Â°C at many places. The capital and operational cost of conventional evaporative air cooling system is very high as compared to the investment standards of poultry management in India. Apart from this, poultry sheds are generally located in rural areas where schedule power cuts are normal affair. Hence, majority of the poultry operators do not use proper cooling system which makes them susceptible to the adverse effects of temperature on production cost and hence profits. The present work is focused on study of low cost practices for cooling poultry birds through operational interventions. This study will help to plan for reducing mortality, improve productivity and thereby increase profit for the farm owner. Rahul Ralebhat and Pramod Kothmire. "Heat Stress Management Practices in Poultry." International Journal for Scientific Research and Development 4.6 (2016): 76-79. Human hair is a waste product and its disposal is concern for environment due to its non-biodegradable nature. The human hair possess similar properties to that of other synthetic fibers. The hair fiber reinforced concrete is the type of concrete the mixture of concrete with discontinuous discrete fibers which results in the tensile strength and also reduces the growth of micro cracks in the concrete. Hair fiber reinforced concrete is very effective and economical process to enhance the physical and mechanical properties of the concrete. In present study an attempt is made to review the use of human hairs in concrete and its properties. It is observed that hair fibers can successfully be used in concrete and it also results in improvement of mechanical properties of concrete. Alok Jain and Anubhav Kumar Hindoriya. "Use of Human Hairs in Concrete." International Journal for Scientific Research and Development 4.6 (2016): 80-82. Sugarcane bagasse is a waste-product of the sugar cleansing industry. The bagasse is fibrous in nature. A very large amount of bagasse ash is obtained from these industries which requires its disposal and environmental problems. The bagasse ash can be used as partial replacement of fly ash in fly ash bricks with significant alteration in properties of bricks. In present study, the effect of bagasse ash is investigated when used as replacement in fly ash bricks. The bricks prepared with different amount of bagasse ash and fly ash are tested for strength and other properties. It is observed that compressive strength is decreased along with density as bagasse ash is used to replace fly ash in bricks. However, the density is also found to decrease by about 80%. Surya Bhushan Singh and Ayush Bhardwaj. "Use of Sugarcane Bagasse Ash as Brick Material." International Journal for Scientific Research and Development 4.6 (2016): 83-85. Ganesh Digambar Wakte. "A Novel on Wireless Power Transmission: An Innovative ." International Journal for Scientific Research and Development 4.6 (2016): 86-89. -Rahul S Patel	; Miss.Wable A Aparna; Prof. Mulajkar R. M.
Video classification and retrieval have an increasing wide spectrum of promising applications, motivating the interest of researchers worldwide. The content-based retrieval technique is helpful in video police work and likewise as getting ready to field (CCTV) imagination. The goal of this paper is to retrieve video section supported the visual content. During this paper associate outline of the visual content based video classification and retrieval methodology is conferred. It includes methods for video shot boundary detection and key frame extraction. Rahul S Patel, Miss.Wable A Aparna and Prof. Mulajkar R. M.. "A Survey on Multi Media based Indexing and Retrieval." International Journal for Scientific Research and Development 4.6 (2016): 90-92. Circular silos are constructed for many industries to store the material such as food grains, cement, clinker etc. in large quantities. The lateral loads such as earthquake and wind have a vital effect on the structure causing a lot of damage, failure of structure and huge loss to the industry. Hence it is necessary to study the response of such structures under earthquake forces. The behavior depends upon the ground motion characteristics as well as the mass ensiled in the silo. In order to reduce the effect of such forces, various lateral load resisting systems are provided in supporting sections i.e. in between columns. The present study is about the static and dynamic behaviour of silo subjected to earthquake forces situated in all zones of India. Shear plate elements as well as bracing elements are used as lateral load resisting units between adjacent columns. The 3D modelling and analysis is carried out using structural analytical tool SAP-2000. The combinations of loads are defined as per guidelines provided in Indian standard codes. Response spectrum method of analysis is used for the dynamic analysis of silo structure. In this study, results are obtained and compared in the form of base shear, maximum displacement, natural time period and stresses. From the comparison of results the best suitable element is obtained and suggested to enhance the performance of the silo structure under earthquake loads. Washuda I Dhundasi and M. B. Ishwaragol. "Static and Dynamic Behaviour of Circular Silo with Different Lateral Load Resisting Systems." International Journal for Scientific Research and Development 4.6 (2016): 93-100. In this work, it is proposed to design a low cost shoe polishing machine, incorporating coin mechanism and shoe polish dispenser with this machine. As everyone including school college students, professionals and people attending functions want to wear a shoe which is shiny. Objectives of the project are to provide cost effective, ergonomically designed, reduce time consumption & produce quality shine product to the customer. Somashekara, B. Ramesh Nayak and T. Raghu. "Design and Development of Low Cost Shoe Polishing Machine." International Journal for Scientific Research and Development 4.6 (2016): 101-102. In SDLC, Testing is the technique to evaluate a software to detect differences between given input and expected result. Testing evaluates the standard of the software deliverable. In other words, Testing is a process of verification and validation. Manual testing is performed by a tester carefully executing the test cases. In Automation Testing, an automation tool to execute your test case suite. The automation tool can also feed the test data into the System under Test, compare actual and expected behaviors and produce detailed test reports. Test Automation demands resources and considerable amount of investments of money. Using a test automation software, it is possible to record the test suite and play it again if it is required. No human effort is required, once the test suite is automated. Automation increases Test Coverage and speed of test. The goal of the thesis is to present a comparative analysis of automation tools such as Selenium RC, Selenium Web Driver. The aim of the thesis is to analyze two automation software testing tools and evaluate to determine their productiveness and usefulness. Selenium is a most likely automated testing suite. Selenium is developed in a way to support and promote the automation testing of behavioral outlook of web based applications and a broader range of browsers and platforms. Due to its presence in the large open source community, it has become one of the most desired tools among the testing professionals. Selenium is not just a single automated tool, rather a package of several automated testing tools. Mahan Sunhare and Abhishek Tiwari. "Survey of Comparative Study for Automated Tools Such as Selenium RC, Selenium Web Driver." International Journal for Scientific Research and Development 4.6 (2016): 103-105. Consideration of site specific lateral loading due to wind or earthquake loads along with vertical gravity loads is important for finding the behavior of the tall buildings. As the height of a building becomes taller, the amount of structural material required to resist lateral loads increases drastically. The design of tall buildings essentially involves a conceptual design, approximate analysis, preliminary design and optimization, to safely carry gravity and lateral loads. The design criteria are strength, serviceability and human comfort. The aim of the structural engineer is to arrive at suitable structural schemes, to satisfy these criteria. Safety of the structure is checked against allowable limits prescribed for base shear, roof displacements, inter-storey drifts, and accelerations prescribed in codes of practice and other relevant references in literature on effects of earthquake and wind loads on buildings. The present study mainly focuses on computation of percentage of steel in different seismic zones with combined lateral forces. The current Is code for seismic design i.e. IS 1893-2002 part 1 suggests that maximum reinforcement should be provided for higher seismic zones. In following work attempt is made to find the requirement of percentage of steel in different seismic zones and wind zones by using ETABS-2013(structural analysis software tool. Ashwini Kadnoor, Prof. Maneeth P D, Prof. Brij Bhushan S and Prof. Shaik Abdulla. "Combined Effect of Lateral Loading System on RC Framed in Different Seismic Zones for Computing Percentage of Steel." International Journal for Scientific Research and Development 4.6 (2016): 106-110. Gesture recognition has gained lot of popularity and become the new generation user interface. Developing an interactive user interface is the trend and gesture recognition provides a very good platform to build it. Gestures have been an important part of our life from a very long time, used to convey message or communicate without the need of language. To use these interactive system based on gestures, one does not require any prerequisite knowledge as in the case of touchscreens, keyboard etc. The aim is to develop a plug and play gesture recognition system (GRS) which can be scalable to any kind of application like playing a game or displaying an interactive advertisement. To build a complete plug and play device so that it is portable and easy to carry. This device provides a natural user experience at an economical price and opens a wide platform for future enhancement. To obtain a small device we have used Raspberry Pi along with the gesture recognition sensor which communicates with Raspberry Pi over I2C bus protocol. Shweta, Ashwatappa and Dr. H N Suresh. "Design and Development of Natural User Interface using Raspberry Pi." International Journal for Scientific Research and Development 4.6 (2016): 111-113. In wireless sensor network, for transmitting the data, it is desirable to know the location of sensors. In WSNs, for obtaining this kind of information we need localization techniques. In this paper, we first analyze the key aspects that have to be considered when designing or choosing a solution for the localization problem. Then, we present the types of current beacon-based localization algorithms, making a broad comparison among the most relevant algorithms. The overview of the schemes proposed by different scholars for the improvement of localization in wireless sensor networks is also presented. Also it is also dis-cussed that APIT scheme performs best when we simulate irregular radio patterns and random node placements. It also works well when low communication overhead is desired. Future research directions and challenges for improving node localization in wireless sensor networks are also discussed. Barkha Bajaj. "Performance Evaluation and Cost Analysis of Beacon-based Distributed Algorithms for Localization of WSNs." International Journal for Scientific Research and Development 4.6 (2016): 114-117. This study was initiated with a view to understand the essentiality of IT in MI. The conceptual framework is developed for the understanding of MI in international context as well domestically. Marketing intelligence is â€œa continuing and interacting structure of people, equipment and procedures that, in combination, gather, sort, analyse and distribute pertinent, timely and accurate information for use by marketing decision makers to improve their marketing planning, implementation and controlâ€ Although many professionals do much of their own information gathering and analysis, there still needs to be a clear focal point of the Marketing Intelligence System responsibility. This may be a named individual or a small group of people who have the distinctive skills needed The system represents a decision support system for marketing activity. It consists of information technology â€“ mainly based on internet system, marketing data and modelling capabilities that enable the system to provide predicted outcomes from different scenarios and marketing strategies, so answering "what if?" questions. An electronic collections of information obtained from data sources within the company. A. Thangaraja. "The Indispensability of Information Technology in Marketing Intelligence System: A Conceptual Approach." International Journal for Scientific Research and Development 4.6 (2016): 118-121. Energy detection is a challenging problem in several applications in cognitive radio communications. In cognitive radio the spectrum is under-utilized. Proper employment of these channels are needed. This work determines the various effects of multipath fading on energy detection and their performance evaluation. For detecting energy Rayleigh channels and additive white real Gaussian signal and noise is used. It has been observed that detection performance is degraded by increasing multipath and cascading channels. Further the optimization of cooperative spectrum sensing with energy detection to minimize the total error rate is considered. An optimal voting rule for optimal value of cognitive radios is used. The different error levels are founded by varying the SNR values to find the optimal number of CRs for minimizing the error levels. Shalinee and Shelej Khera. "Performance Evaluation of Cooperative Spectrum Sensing in Cognitive Radio." International Journal for Scientific Research and Development 4.6 (2016): 122-125. Miss Anuja Shirake and Prof. S. V. Patil. "A Review on Cooperative OFDM System for Wireless Communications." International Journal for Scientific Research and Development 4.6 (2016): 126-130. Agriculture is backbone of India, where irrigated agriculture sector plays an important role in its economic development and poverty alleviation. Near about 70-75% of population in India is dependent on agriculture for its livelihood. Agriculture contributes about 16% of total GDP and 10% of total exports. Irrigation is the base for about 56% of total agricultural output. Recognizing the importance of irrigation as a crucial input in Indiaâ€™s agricultural development harnessing of water resources for irrigation through motor pumps is necessary. Irrigation in India is carried by various types of systems such as wells, tanks, perennial canal, multipurpose river valley projects, inundation etc. Running 3 phase pump on single phase supply leads to unbalanced condition in the system that leads to various negative effects such as overheating, insulation degradation, line current unbalance, torque pulsation, de rating and inefficiency. In spite of these adverse effects on motor and irrigation feeder, it is observed that farmers run their 3 phase motor on single phase supply and under reduced voltage condition using capacitor splitter. A case study of capacitor based phase splitter (single phase supply mode) is implemented on work bench and compared the performance after simulating the similar in MATLAB/SIMULINK. As a extension of work a comparative study of operation of pump motor for balanced and unbalanced supply condition is also done. Mallikarjun. G. Hudedmani, Iranna. Hiremath, Shrithi Yaligar, Arshadaunnisa Banu S and Meghna P. "A comparative Study of Capacitor Phase Splitter for the Operation of Irrigation Pump Motors." International Journal for Scientific Research and Development 4.6 (2016): 131-134. Many sophisticated electronic systems depends on transducers like temperature sensors, pressure sensors, vibration sensors, shock and strain gauge to measure the parameters in engineering units. ADC and DAC with support of high end microcontrollers will play a major role in data acquisition systems. The resolution of ADC will define the accuracy of the system. ADC with analog multiplexer will provide multiple channels to acquire pressure, temperature, vibration and shock. Most of the pressure channels will provide DC voltage from 0 to +5v range full scale. The selected ADC with highly stable reference voltage, the signal conditioner and a low pass filter to suppress the noise will make full fledged data acquisition channel for measurement of pressure in Bar. High end microcontroller ADuC7026 with built in 12 ADC, 4 ADC/DAC, set of timers, general purpose I/Oâ€™s and UART will provide accurate results to design multichannel data acquisition systems. Now a dayâ€™s microcontrollers with built in ADC and DACâ€™s, timers, UARTâ€™s are available to make system very small and compact. One can develop embedded software to suit the system requirement with well defined communication protocol with user defined sampling rates. Data will be provided on RS-232 interface to application software. Where, pressure data will be displayed in tables with time stamp. Application (GUI) will be provided with a set of plots and graphs, where user can visualize the pressure data in engineering units. Data can be logged into excel sheets for feature reference. Advance microcontrollers and application software makes realization of data acquisition system with high degree of accuracy and ease. Vinaykumar Bagali. "Design of 32 Channel Advance Pressure Transducer Data Evaluation System." International Journal for Scientific Research and Development 4.6 (2016): 135-138. OTFT is a key element for building electronic circuits on a low cost flexible substrate. In OTFT, Dual gate structure is a promising method to improve the device performance. As p type OTFT is better than n type OTFT, p type dual gate structure is used in this work. In this paper we propose a current mirror using dual gate thin film transistor with excellent characteristics. Shilpa Saini, Deepa Saini and Yogendra Saini. "A High Performance Current Mirror using Dual Gate Organic Thin Film Transistor." International Journal for Scientific Research and Development 4.6 (2016): 139-141. In modern IC amplifiers an essential building block is the differential amplifier. Many electronic devices internally use differential amplifiers. There is a type of electronic amplifier is differential amplifier that multiplies the difference between two inputs by some constant value and this constant value is called differential gain. In this paper we propose a differential amplifier implemented using dual gate organic thin film transistors (OTFTs). P-type pentacene dual gate OTFT structure is used to design amplifier device. Implementation and simulation of device is done using industry standard Atlas (Silvaco) 2-D device simulator. Results show that the amplifier has well behaved large signal characteristics and good linearity for inputs between -1 and 1 V.
Shilpa Saini and Yogendra Saini. "Implementation and Simulation of a Differential Amplifier using Dual Gate Organic Thin Film Transistor." International Journal for Scientific Research and Development 4.6 (2016): 142-144. In this paper OTFT basics, working, analytical model and dual gate OTFT is presented in detail with methodology and simulation setup used in the work. Furthermore a comparison in single and dual gate OTFT parameters has been given. And shows that dual gate OTFT has superior performance over single gate OTFT in terms of mobility, current onâ€“off ratio, transconductance, sub-threshold slope and threshold voltage. Shilpa Saini and Yogendra Saini. "Modelling and Comparison of Single Gate and Dual Gate Organic Thin Film Transistor." International Journal for Scientific Research and Development 4.6 (2016): 145-148. India is country in which agriculture plays one important role in enhancing the countryâ€˜s GDP rate and enriching the countryâ€™s pride. Hence it is end of the hour of a to emphasize something innovative towards agriculture. Water plays an important role in the world economy. Agriculture consumes more water than any other source and also wastes much of that through inefficiencies. Our proposed system makes efficient use of available water through automatic Water Management system. An Intelligent Irrigation system is the sensor network which senses the information about soil moisture using copper plates and the sensed information is sent to the microcontroller. The microcontroller then compares the sensed soil moisture value with the threshold moisture value. When soil moisture in the field is less than the threshold level, then the motor is turned ON through the registered mobile phone user. When the motor is started, soil moisture is constantly monitored and once the soil moisture reaches the sufficient level then the motor is turned off by the user and the notification is sent to the user through Global System for Mobile communication network. Thus this system can effectively reduce water wastage compared to the conventional systems. Amra Jeelani Bijli H and Keerthana Sundaravalli S. "Intelligent Agricultural Irrigation Control System." International Journal for Scientific Research and Development 4.6 (2016): 149-151. With urbanization and expanding unbalance of obliged space to accessibility, it is getting to be basic to give open ground story in business and private structures. These procurements lessen the firmness of the parallel burden opposing framework and a dynamic breakdown gets to be unavoidable in a serious seismic tremor for such structures because of soft story. Soft story conduct display higher burdens at the segments and the segments come up short as the plastic pivots are not framed on foreordained positions. In this way, the powerlessness of soft story impact has brought on basic specialists to reevaluate the outline of a soft story working in ranges of high seismicity. The present diagnostic study explores the impact of a few parameters on conduct of a working with soft story. The demonstrating of the entire building is completed utilizing the PC program ETABS. Parametric studies on displacement, drift, base shear, time period and storey forces are studied and compared from different models and methods of analysis. In this study we choose nine models for our study. Maheboob Pasha, Dr. Shreenivas Reddy Shahapur, Maneeth P. D, Brij Bhushan. S and Rohan Gurav. "Static and Dynamic Analysis of Reinforced Concrete Buildings with First Soft Storey." International Journal for Scientific Research and Development 4.6 (2016): 152-156. In this paper an experimental investigation is carried out on Sixteen HSC beams with constant width (125 mm) and varying depth (130mm and 100mm) by varying (i) shear span to depth ratio, (ii) the longitudinal reinforcement ratio and (iii) the minimum, maximum and no web reinforcement ratio were casted and tested to understand the shear behavior of the beams. The study is also carried for no web reinforcement. The load-deflection behavior and the failure pattern of the beams, ultimate shear strength and reserve shear strength are studied with varying a/d ratio, varying the cross-section and longitudinal reinforcement. The results obtained are compared with the different codal equations. Based on these observations, it can be concluded that, there are many parameters influencing the shear behavior of RC beams such as shear span to depth ratio (a/d ratio>2), depth of the beam and the percentage of the longitudinal reinforcement. Ram Panth and B. K. Kolhapure. "Shear Studies on High Strength Concrete Slender Beams." International Journal for Scientific Research and Development 4.6 (2016): 157-161. This paper deals with study of mechanical properties of titanium dioxide (TiO2) and tungsten carbide (WC) reinforced epoxy based polymer matrix composite materials. Composite specimenâ€™s reinforcing Tio2 and WC at three different weight percentage (0%, 5%, and 10%) were prepared by casting technology in wooden moulds. Tensile and flexural properties of both reinforced and unreinforced epoxy was checked. All tests were conducted as per ASTM standards. Tests were conducted at room temperature. From results it was found that there is increase in tensile and flexural strength for WC reinforced epoxy composites but TiO2 reinforced results in decrease in tensile strength for both 5% and 10%. Mr. Anil Pol, Nachiket Chanshetti and Mr. Ashok. "Mechanical Properties of TiO2 and WC Reinforced Epoxy Resin Composites." International Journal for Scientific Research and Development 4.6 (2016): 162-164. Lubricants play a vital role in machine performance, machine life, reducing wear and friction and preventing component from failure. Poor performance of lubricant can cause significant energy and material losses. To improve the lubricating properties of bearing oil, nanoparticles can be added in bearing oils. In this research Aluminium Oxide (Al2O3) nanoparticles were added into the SN-500 base oil and tribological properties were examined. The concentrations of Al2O3 nanoparticles prepared in SN-500 base oil are 0.1 wt. %, 0.5 wt. %, 0.75 wt. % and 1 wt. %. The trials of friction and wear were carried out on a pin on disc tribotester, with varying the concentration of nanoparticle and by varying load (10N, 30N & 50N). The obtained results were compared between Al2O3 nano oil and SN-500 base oil. The results showed that 0.5wt% for Al2O3 nano fluid concentration was an optimum concentration for wear. For the friction reduction test, when Al2O3 nanoparticles were added into a base oil, the coefficient of friction reduced by 19%, 35% & 52% at 1wt% concentration as compared to base oil without nanoparticles. Shashikant B Dhokate and Prof. V. P. Mali. "Tribological Properties of Al2O3 Nanoparticles Added in SN-500 Base Oil." International Journal for Scientific Research and Development 4.6 (2016): 165-167. Big Data concern large-volume, complex, growing data set with multiple, autonomous sources. With fast development of networking, data storage and data collection capacity Big Data are now rapidly expanding in all science and engineering domains including physical, biomedical sciences and biological. Wireless Sensor Networks (WSNs) have become a new monitoring solution for a variety of applications and information collections. Error occurring to sensor nodes are common due to the harsh environment where the sensor nodes are deployed and sensor device itself. To ensure the network quality of service it is important for the WSN to be able to detect the errors and take actions to keep away from further degradation of the service. However, these techniques do not give efï¬cient support on quick detection and locating of errors in big sensor data sets. In this paper, develop a new data error detection approach which abuses the full computation capability of cloud platform and the network feature of WSN. That Proposed approach can significantly reduce the time for error detection and location in big data sets created by large scale sensor network systems with acceptable error detecting accuracy. In this paper explores using the K-Mean Clustering algorithm to further improve the accuracy of determining the number of error detection and attackers. In addition, it develops an integrated detection and localization system that can localize the positions of multiple error detection algorithms. N. Revathi and T. P. Senthil Kumar. "A Survey on Enhanced Big Sensor Error Detection Model Using K - Means Clustering Algorithm." International Journal for Scientific Research and Development 4.6 (2016): 168-171. Data mining is also called as knowledge discovery in database (KDD). The concept of data mining include several research field such as statistics, database systems, machine learning concepts etc, and computer processing all have their influence on data mining concepts. The data is the most essential vital asset of any company however, in case the data is changed or a bad data entry is created certain errors like duplicate detection arises. Duplicate detection is that method of identifying the multiple representations of same real world entities. Duplicate detection methods need to process every larger datasets in every shortest period, maintaining the quality of a dataset becomes increasingly difficult. In this paper, presenting the two novels of progressive duplicate detection algorithms such as PSNM and PB that significantly increase the efficiency of detects the duplicates, if the execution time is limited. They maximize the gain of the overall method within the available time by reporting most results are significantly much earlier than traditional approaches. A comprehensive experiment shows that progressive algorithms will double the potency over time of traditional duplicate detection and considerably improve upon related work. This survey discuss about both method such as progressive Sorted Neighborhood method and Progressive Blocking method. P. Kiruthika and S. M. Jagatheesan. "Progressive Duplicate Detection: A Survey ." International Journal for Scientific Research and Development 4.6 (2016): 172-174. There is a huge growing requirement of building materials in India due to the existing housing shortage of 46.3 million units, mainly for the low income groups in urban India. Estimated urban housing shortage in 2015 was 56.43 million, while the housing shortage of rural India in 2015 was 62 million units. Thus total estimated housing shortage for Urban & rural India in 2015 was 128.43 million units. To fulfill this basic need of urban habitat; India requires innovative, energy efficient building materials for strong and durable housing in fast track method of construction at affordable cost. All these concerns have lead to develop an energy efficient and economical material. Lightweight pre-fabricated Sandwich wall Panel which provides rapid or faster construction and contributes to environmental protection, can provide a solution to many of the above issues and concerns. The paper describes the overview of sandwich wall panel, method of construction and its properties. Additionally, this sandwich construction deals with the problem of delimitation of face sheets leading to their premature failure. This can be avoided by providing binding cover over the core. The study conducted involved the development of high performance cement based mortar mix to cast Ferrocement cover. The results revealed the potential application of Ferrocement cover over lightweight insulation core to produce lightweight structural elements which leads towards the industrialization of building system. Piyush K. Bhandari. "Evaluating Properties of Lightweight Sandwich Wall Panels." International Journal for Scientific Research and Development 4.6 (2016): 175-178. The vehicle population is quickly increasing in our country as all over the world which reveals the high load on the roads beyond their capability. Rapid increases in vehicle population have put enormous strains in all urban roads in all million plus cities in India. High vehicle ownership and poor supporting public transport facilities are in particularly in the urban cities where the population is between 1 to 2 million. To alleviate traffic congestion problems, several modern cities around the world take measures into consideration including increased investment in public transport and construction of new urban mass transit systems underground or above ground (either at surface or elevated). There is no one right transit decision. The best designed system will depend upon local conditions and local preferences. Geographical and physical situation, topological configuration, financing, know-how, technical capability, institutional capacity, and political constitute local conditions whilst low cost, high customer service level, rapid journey, convenience, comfort, frequent service, safety, and security constitute passengersâ€™ preferences. Therefore selecting an appropriate mass transit system necessitates a several conflicting criteria decision aid which will take all these conditions and preferences into consideration. This study aims such a recommendation by evaluating suitable mass transit systems for urban transit based on the related criteria. In accordance with the proposed decision making process, the research group act as decision analysts and interact with experts in transportation sector for acquiring their knowledge and expertise. Praveen Kumar Sharma and Vijay Singh Solanki. "Criteria of Providing Means of Public Transport System in Million Plus Cities in India." International Journal for Scientific Research and Development 4.6 (2016): 179-183. A present analysis, the mixed mode fracture of a combine of extremely rotating metallike blades has been investigated at numerous analysis by predicting experimental and numerical approaches. A establishment lecturers involvement in analysis of fracture and crack propagation. The notch is found in numerous blade positions from blade root to tip. The correlation of notch cracks at blade forefront and edge is additionally studied. An easy theoretical model of a undulation Bernoulli-Euler-Beam like rotary wing model is established for analytic study. The experimental results show that the cracks grow quicker within the case of the control surface with higher pitch angle. The analytic study of blade fluttering motion conjointly shows the importance of the force in rotating machines. Itâ€™s instructed that the force ought to be enclosed in determination the rotating fracture issues. Ravi Shankar Prabhat , Ghanshayam Satnami and Anil Kumar Rao. "Parameters Influencing Effect of Fracture on Blades with Finite Element Method Approach:A Review." International Journal for Scientific Research and Development 4.6 (2016): 184-187. The paper deals with thermal management of RF-section of 250kW CW C-band Klystron. The thermal analysis of RF section has been done using ANSYS 11.0 (multi-physics) code. The thermal analysis calculates the temperature distribution and related thermal quantities in a system or component. The basis for thermal analysis in ANSYS is a heat balance equation obtained from the principle of conservation of energy. The input parameters used in thermal simulation are geometry of components, heat flux, heat transfer coefficient and output parameter is temperature profile of RF section. The RF section analysed using Poissonâ€™s Superfish, AJ-Disk and Magic 2D soft-wares to observe the electron-beam interaction in the RF-section of the Klystron. The results of these simulations i.e. R/Q, Q and the voltage across the gap of the cavity are then used to calculate heat dissipated in the RF section. Suman and Shelej Khera. "Thermal Analysis of RF Section for 250 kW CW C-Band Klystron." International Journal for Scientific Research and Development 4.6 (2016): 188-190. The fixture is a special tool for holding a work piece in proper position during manufacturing operation. For supporting and clamping the work piece, device is provided. Frequent checking, positioning, individual marking and non-uniform quality in manufacturing process is eliminated by fixture. This increase productivity and reduce operation time. Fixture is widely used in the industry practical production because of feature and advantages. To locate and immobilize workpieces for machining, inspection, assembly and other operations fixtures are used. A fixture consists of a set of locators and clamps. Locators are used to determine the position and orientation of a workpiece, whereas clamps exert clamping forces so that the workpiece is pressed firmly against locators .Clamping has to be appropriately planned at the stage of machining fixture design. Shivaji Popat Mengawade, Vaibhav Bankar and Pratik Chaphale. "Design and Analysis of Work Holding Fixture." International Journal for Scientific Research and Development 4.6 (2016): 191-194. Biogas technology is a particularly useful system in the Indian rural economy and can fulfill several end uses. Gas is use as a fuel substitute for firewood, dung, agricultural residues, petrol, diesel, and electricity, depending up on task, and local supply conditions and constraints, thus biogas energy is used for cooking and lighting. Biogas systems also used as a residue organic waste after anaerobic digestion that has superior nutrient qualities over the usual organic fertilizer, cattle dung, as it is in the form of ammonia. Anaerobic digesters are function as a waste disposal system, particularly for human waste and prevent potential sources of environmental contamination and the spread of pathogens. Small-scale industries are also alternate from the sale of surplus gas to the provision of power for rural industries. Therefore, biogas also offers the user with additional income generating opportunities. This gas can also use for power engines, in a dual fuel mix with petrol or diesel and may use in pumped irrigation systems or other domestic purpose. Devinder Sheokand, Devinder Sheokand and Ram Avtar Jaswal. "Biomass Gasifier: A Relative Approach with FLC." International Journal for Scientific Research and Development 4.6 (2016): 195-197. Nowadays as we know most of the loads that we are using will inject harmonics into the system. For removing the harmonics content, in this project we are using two feeders in a distribution system in which a normal transformers are used in both the feeders. In this case we are going to replace one of the feeder transformer by a smart transformer, which consists of three different stages that is rectifier, buck converter and inverter. Rectifier converts ac to dc and buck converter used for stepping down dc and inverter used for dc to ac. So, the operation of the smart transformer is same as normal transformer. But, rectifier consists of IGBT valves, it needs pulses for operation. For generating the pulses we are using ANFIS controller. In that two currents will be taken from both the feeders and it is compared to the reference current and depending on the changes in the current value the pulse will be generated. The current changes means if any harmonics present in the system means it affects the current values so the change value is taken for pulse generation so that the amount of change in current is maintained by the rectifier by taking the pulses given by the ANFIS controller. Thus, the harmonics, unbalance and other things will be mitigated. Anurag S and Shakeer Ahammad Shaik. "ANFIS Control of Smart Transformer for Distribution Systems." International Journal for Scientific Research and Development 4.6 (2016): 198-204. In this research work an improved way of unloading material from dumper is design. Conventional Dumper unloads material only at back side of dumper which may cause problem of road blockage in limited space area. The right side dropping dumper overcomes problem of unloading the material by using hydraulic cylinder. Modern right side dropping dumper has been conceived by observing difficulty in unloading the material. Hence suitable arrangement has been designed for small vehicle (TATA ace). The vehicles can be unloading material from right side. The concept leads to efficient working. Ritesh Bhawarkar and Prof. R. R. Gandhe. "Design & CAD Simulation of Right Side Dropping Dumper (for Small Vehicle)." International Journal for Scientific Research and Development 4.6 (2016): 205-210. As the VLSI circuits become denser, every element in the system gets complicated. With the increase in number of chips embedded on a core, the on chip communication subsystem becomes prominent. Shrinking VLSI technology to nanometer scale, the links of the network on chip dissipate more power. This power dissipation by the links starts to compete with the power dissipated by the other essential elements of the communication subsystem, namely, the network interfaces and routers. The dynamic power dissipation in network links is the major contributor to the power consumption in network on chip. This is due to the switching activity in the links. The self-switching and the coupling capacitance are the most important causes for the dynamic power dissipation. A set of three encoding techniques are proposed to minimize the switching activity in the links. The proposed scheme reduces the self-switching by seeing the switching transition, and then the cross coupling capacitance between the links is checked and verified that the power consumption is decreased at the links of the network interface (NI). The proposed schemes can be employed without any modifications to the link and router design. These schemes are tested for several inputs and the effectiveness of the scheme is verified by synthesizing the proposed design in Xilinx ISE which is coded in Verilog HDL and simulated in ISim simulator. FPGA implementation is done on Xilinx Spartan-3E kit. The proposed design controls power dissipation and the energy consumption without any considerable performance degradation and with a reduced amount of area overhead in the NI. Nikhila Kamath. "Data Encoding Techniques for Network on Chip Links." International Journal for Scientific Research and Development 4.6 (2016): 211-214. Sumit Kumar and Vijay Garg. "Dynamic Voltage Restorer for Compensation of Voltage Sag: An Overview." International Journal for Scientific Research and Development 4.6 (2016): 215-217.